5 Bedroom Detached House For Sale in Harpenden for Asking Price £1,750,000. 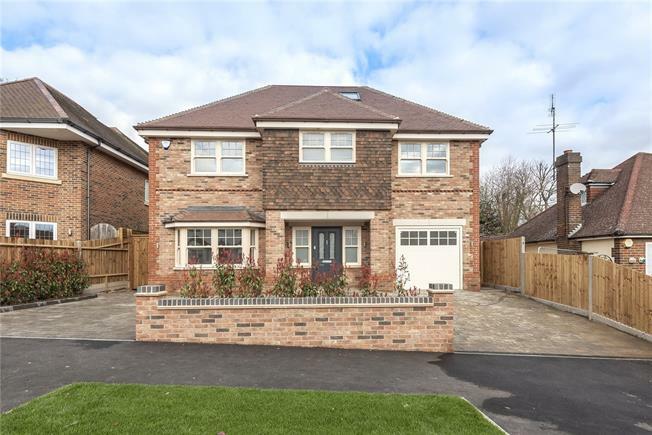 A spacious detached family home forming part of this exclusive development located within this highly regarded residential area close to the station, centre and excellent junior and secondary schools. Constructed to a very high specification by local developers of repute, Harpenden Homes, this fine home has stylish finished accommodation arranged over three floors. On the ground floor there is a stunning open plan kitchen/dining family space featuring a modern fitted kitchen with large island and a range of Siemens appliances. This room also features a part vaulted ceiling with remote controlled, rain sensor roof lights and an expanse of bi-fold doors leading onto the landscaped garden. also on the ground floor is a spacious entrance hall, living room, study, utility room and cloakroom. On the first floor there are four bedrooms and three bathrooms (2 en suite) and on the second floor there is a generous bedroom suite with luxury bathroom. To the front there is a driveway providing off street parking and giving access to the garage. To the rear there is a delightful garden with extensive paved patio area leading to a lawn bordered by shrub beds and secure fencing. West Way is a much favoured road with central Harpenden affording easy access to the station, High Street and outstanding schools. Harpenden is well noted for its excellent choice of schools for all age groups, sports and social facilities and a comprehensive range of restaurants and bars. Harpenden benefits from a fast train service to St Pancras, the City, Gatwick Airport and Brighton.